Detailed within this section are the official Driver and Vehicle Standards Agency (DVSA) motorcycle test pass rates for module 2 (on road). Test results include licence and test categories A, A1 and A2. Statistics are compiled from all UK motorcycle riding test centres conducting the mod 2 practical tests and are compiled on a quarterly basis. Pass rates range from April 2017 to March 2018. The practical modular testing system (module 1 and module 2) was first introduced on 27 April 2009. 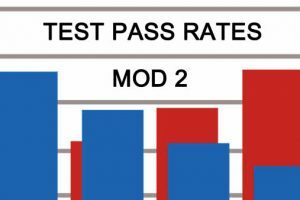 Results and therefore pass rates are based on manual entries undertaken by the examiners conducting the module 2 test. Variations in results may occur due to the driving licence number, where a single individual who has changed licence number could be reported multiple times. Use the A-Z menu to find the MOD 2 pass rates for your local motorcycle practical test centre of your choice. Statistics are a combination of male and female candidates. These are the national motorcycle riding test pass rates (module 2, on road) for all test centres combined, male and female candidates combined from 2009 to 2018. 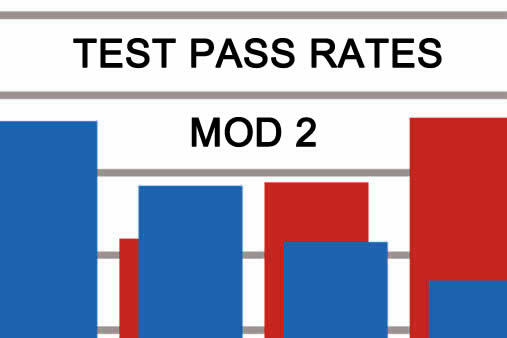 These are the motorcycle test pass rates for module 2 (on road) for male and female candidates. Number of tests conducted, number of test passes and for all UK test centres.